The number of targeted cyber-attacks increased an alarming 91% last year, with mining companies as well as oil and gas firms among the most at risk of being attacked, reveals a study published Tuesday. According to US-based IT security provider Symantec, personal assistants at large mining companies and PR people were the most targeted by these kinds of online criminals. In fact, one in 2.7 mining firms were subject to email-based attacks or “spear phishing,” last year. In its Internet Security Threat Report 2014, Symantec shows a significant shift in cybercriminal behaviour towards what it calls “mega breaches,” revealing the bad guys are plotting for months before pulling off huge heists, instead of executing quick hits with smaller rewards. 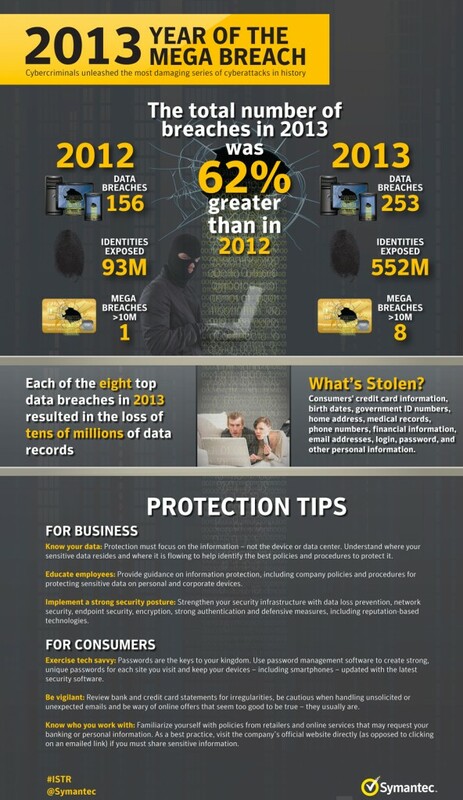 Source: Symantec's Internet Security Threat Report 2014. "One mega breach can be worth 50 smaller attacks," says Kevin Haley, director, Symantec Security Response. "While the level of sophistication continues to grow among attackers, what was surprising last year was their willingness to be a lot more patient —waiting to strike until the reward was bigger and better." The company adds that each of the eight top data breaches in 2013 resulted in the loss of tens of millions of data records. By comparison, 2012 only had a single data breach reach that threshold.